Destruction & Degaussing Equipment | Physical Destruction Solutions — DestructData, Inc.
HD-3WXL - Compact, user friendly input system provides effortless loading of various sized hard drives and tape media without the need for adapters. NEW ! HD-2X - Degauss up to 300 drives or tapes per hour with 10,000+ gauss erasure field. TS-1 - NSA approved and erases classified and Top Secret data from hard drives and tapes in 45 seconds. EMP 1000 - Smart Logic processor and fast charge cycle with NSA evaluated model available. T-1.5 - The fastest electromagnetic pulse degausser available. T-4 - NSA approved and produces a bi-directional field using patented Reverse Polarity technology. PD-5 HDD & SSD Destroyer - 50% more crushing power than the PD-4, plus a SSD attachment. 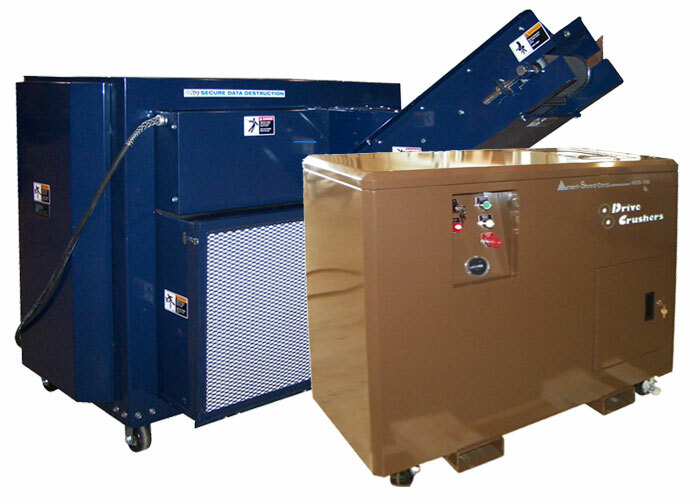 Model 0101 Hard Drive Crusher - NSA approved and delivers 12,000 lbs. of force to a conical punch causing catastrophic trauma to the hard drive chassis while destroying the internal platter. MediaVise Compact HDD Crusher - NSA approved and delivers 40,000 lbs. of hydraulic crushing force for HDDs, cells and PDAs. MediaVise Compact V-Spike SSD Destroyer - The first SSD destroyer to combine physical and electrical forces to sanitize SSDs. MediaVise HDD Crusher - Patented interlocking hardened steel plates deliver 40,000 lbs. of crushing force. MediaVise Compact SSD Destroyer - Total destruction of the SSD's flash memory storage chips, 30 second cycle time. MediaVise SSD Destroyer - Memory chips inside the SSD are punctured and destroyed beyond repair, rendering the SSD completely unreadable. PD-4 HDD Crusher - Destroys multiple hard drives simultaneously. MediaDice Optical Media Destroyer - Destroys CD/DVDs, Blu-ray discs, credit cards, drivers licenses, identification badges, etc. Note: Drives per hour ranges vary on model, voltage, shred width and the type of drive (server or standard). Model 200 Office Disintegrator - Quiet mixed media destroyer that handles optical media, key tape, credit cards, ID badges, thumb drives and more. Model 2 SSD Disintegrator - Processes Solid State drives into particles that are nominally 2 mm edge length in size. Model 3 Disintegrator - Rated by the NSA at 250 lbs. per hour for high security (3/32"). Up to 550 lbs. per hour for Non-Classified applications. Model 22 Disintegrator - Rated by the NSA at 500 lbs. per hour for high security (3/32"). Up to 1,200 lbs. per hour for Non-Classified applications. Model 23 Disintegrator - Rated by the NSA at 600 lbs. per hour for high security (3/32"). Up to 1,300 lbs. per hour for Non-Classified applications. NSA/CSS 04-01 for Key Tape.